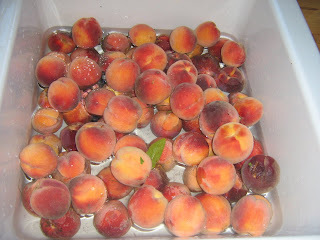 I know, I know Samantha, I am supposed to be resting, but ripe peaches wait for no one. 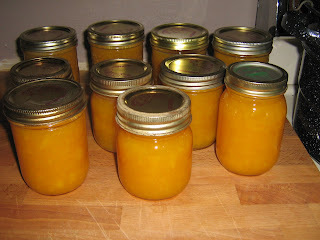 Especially in fruit fly season, if the fruit is ripe you just have to get it preserved, otherwise your kitchen and back porch get filled with the nasty little things. 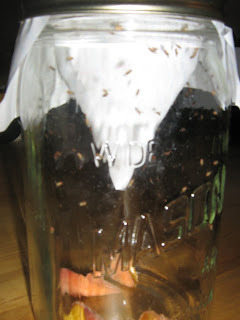 This is a simple fruit fly trap that works like a charm. You make a funnel shape of paper and put it in a mason jar that has a bit of fruit in the bottom. We have two of these and they have trapped hundreds of the wee beasties. Not very animal friendly of me you say? Wha ha ha ha ha, that's the sound of me laughing evilly as I twirl my mustache and watch the nasty fruit flies die. 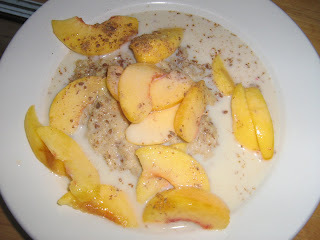 We all seem to be fighting a cold and so to start our morning off right we had oatmeal, with peaches and flax seed. 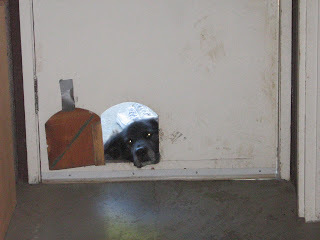 On Wednesday we had our weekly homelearner get-together, as I was locking up to go I said good-bye to this sad face. And you can't see him very well in this blurry pic but this guy is quite fond of our walnut trees. Yesterday I came around the corner of the house and he startled me as he was running along the side wall of the house, pressed flat up against it with a nut in his mouth. He stopped on our water line to eat it while we watched. 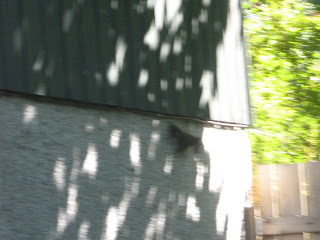 Later E and I were reading The Boys Book in the shade of the walnut tree and we saw him climb up the metal clothesline pole (? ), go along the clothesline in tightrope walking style, then hop to the plum tree and swing up to the walnut tree in the manner of a gymnast. 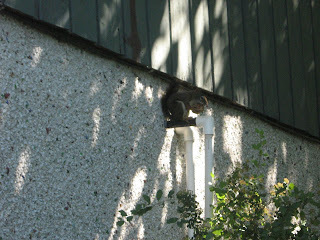 He hangs out on the roof of the boys tree house looking for ripe nuts that are out of their husks.